Pew Poll: More Americans Are Political Purists : It's All Politics Over the past 20 years, Americans who are politically in the middle of the road have lost ground to more ideological hard-liners, a new Pew Research Center survey shows. 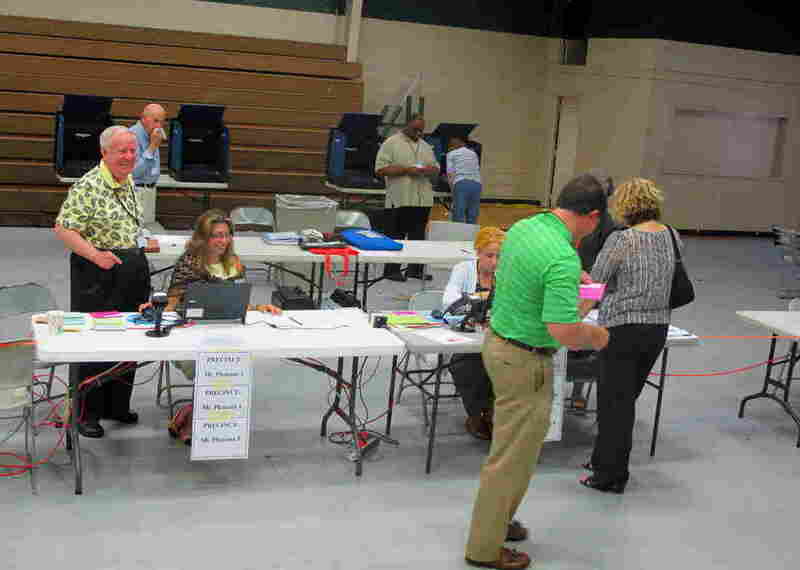 Voters cast ballots Tuesday at a Mount Pleasant, S.C., polling place for the state's primary election. Maybe there's something in humans that pushes them apart the way plate tectonics moves continents. Whatever the reason, the ideological divide between conservatives and progressives in the U.S. has grown over the past decade, and not by a little, according to a new survey by the Pew Research Center. Washington politicians often are criticized for their increased partisanship in recent years, but the Pew poll suggests they are actually truly representing their constituents in this. And there are few signs in the data that provide grounds for much optimism that the trend will reverse itself anytime soon. Enemies of the republic: It's one thing to disagree with and even dislike people who hold ideological views different from yours; it's another entirely to see them as threats to the nation you hold dear. Unfortunately, large percentages of Americans view members of the other major party as endangering the nation, or at least its well-being. Pew reports that 36 percent of Republicans view Democrats as threatening the nation's ongoing success; while 27 percent view Republicans in that light. Those are obviously large segments of the population who intensely distrust other large segments of the population. Negative advertising obviously finds a very receptive audience with these voters. The center doesn't hold: Way back in 1994, when President Bill Clinton was in the White House and the Gingrich revolution was just in its infancy, a Pew survey found 49 percent of Americans to be in the ideological middle, holding progressive views on some issues, conservative views on others. Two decades later, the middle has been squeezed down to 39 percent. Meanwhile, the portion of Americans at either end of the bell curve who maintain an ideological purity has grown significantly, especially among liberals. The percentage of hard-line progressives quadrupled to 12 percent from 3 percent 20 years earlier; hard-line conservatives saw a less steep increase, to 9 percent from 7 percent. While the conventional wisdom is that most of the nation's partisan rancor is due to Republicans' becoming more conservative, the survey suggests that progressives are doing their share to contribute to the gulf as well. Hardliners = money and votes: It's no surprise that voters with the most consistent red or blue ideologies are also the most likely to vote and make campaign contributions, but Pew found an interesting difference between conservatives and liberals. Consistent conservatives who said they always vote exceeded their liberal counterparts by 20 percentage points. But when it came to campaign donations, strong liberals actually outdid their conservative counterparts in that department, having a 6-point advantage. The worst-performing voters and donors were those in the middle. Which is why fundraising emails nearly always use the most extreme language; they're aimed at the true believers for whom issues are black and white with no shades of gray ambiguity. Blue house, red house: Cities have long been liberal bastions while suburbs and rural areas have been more conservative. Pew asked a question that got at that dynamic in a fascinating way. It asked those surveyed whether they would rather live in a community with larger houses that are farther apart and driving is essential to get practically anywhere or would prefer smaller houses that were closer with stores and schools within walking distance. Seventy-five percent of those whose survey answers identified them as consistent conservatives said they preferred the large house, car-dependent community. By contrast, 77 percent of consistent liberals liked the more urban scenario. Reinforcing this, in the answer to another question, 79 percent of mostly or consistently conservative respondents said it was important to them to live in a place where most people shared their political views. That number was 60 percent for those who were mostly or consistently liberal. This gets at a phenomenon that has been called the "big sort," in which Americans are increasingly choosing to live in ideologically homogenous communities. Politically, this plays out in congressional districts being increasingly safe for Republicans or Democrats and the hardening of partisan boundaries in Congress. And there appears to be no near-term reversal of this trend for most congressional districts. Compromise means your side wins: For many people, compromise connotes that both sides come away from negotiations feeling good about a result where neither side got everything it wanted and where there was a parity to the result. Not so in the hyperpartisan atmosphere of contemporary politics. Most consistent conservatives and liberals said their side had to get most of what it wanted in a compromise. Now, remember that these are the same people who nearly always vote and who are the most reliable donors — and the forces that pressure policymakers during Washington's fiscal fights become stark.